When you join the ProSource® team as a showroom owner, you may be following our business model, but you are leading your own team. We offer you a lot of support, but also give you the independence you desire as an entrepreneur. Associating with one of the best franchise opportunities in the U.S. is a clear advantage to success, but you also must possess certain qualities to lead a franchise that thrives. Leaders must be assertive, adaptable, intelligent, positive, and inspiring if they wish for their team to follow them. Not everyone is a natural born leader, but that doesn’t mean that you are resigned to poor leadership. There are ways you can enhance your leadership skills to ensure that your home improvement franchise thrives. What crew would follow a captain that doesn’t know where they’re going? As we have discussed in previous blog posts, in order to be successful, you need to have a vision in mind for your business. Share this vision with your team so they can know where they are heading. In addition, make it clear why this vision is valuable to them as well. Describe in detail how this vision helps the business and the team. Ask them for feedback and include them in planning your strategy so they can buy into your vision for the future. Improving your leadership abilities doesn’t mean that you have to fundamentally change who you are. In fact, you shouldn’t try. 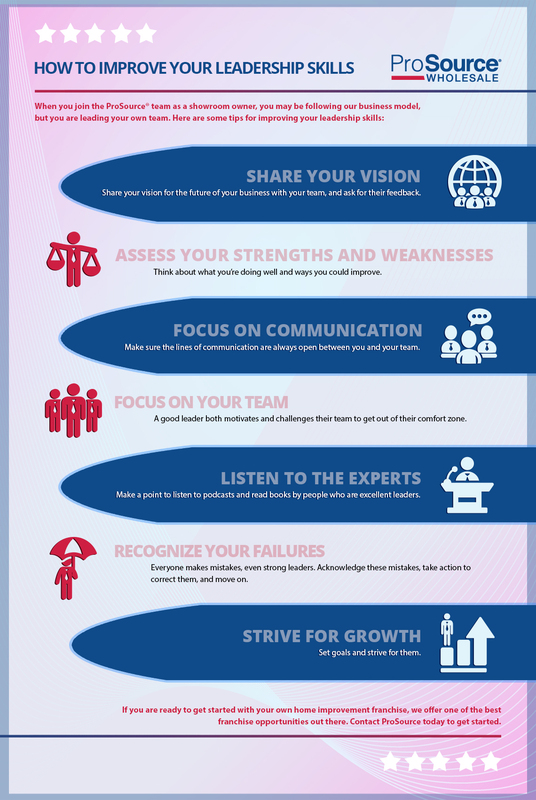 Assess your own strengths as a person and build on these to become a better leader. At the same time, take time to step back and assess your weaknesses as objectively as possible. Think about what you’re doing well and ways you could improve. It may help to talk to someone you respect about this and ask them for advice on how you could improve yourself as a leader. The more time you begin taking an objective, big-picture view of your leadership skills, the better you will become at identifying areas you can improve. It doesn’t matter how talented you are at what you do; if you’re a poor communicator, you will hit a ceiling with your leadership skills. Focus on “over-communicating” with every member of your team to ensure that nothing is lost in translation. Set up regular meetings with your team, even if just for a quick check up, to make sure the lines of communication are open. Maya Angelou said, “People will forget what you said, people will forget what you did, but people will never forget how you made them feel.” At the end of the day, you can tell your team all you want that you care about their success but if your actions don’t reflect this, they won’t feel motivated or inspired by you. A good leader both motivates and challenges their team to get out of their comfort zone. To do this, make an effort to understand what each of your team members brings to the table. Know their strengths, weaknesses, preferences for workflow, and how they work with others. Understanding these personality dynamics helps you ensure that everyone on your team is happy and working in the right way for them. What media you consume has a big impact on your mental state, and in turn, your success. Make a point to listen to podcasts and read books by people who are excellent leaders. It’s easy to fit podcasts and audiobooks into your life, whether you’re commuting to work, cleaning your home, or making dinner. From these, you can receive some crucial tips to help you be a better leader, both in terms of being a boss and owning a business. Everyone makes mistakes, even strong leaders. What makes them strong is acknowledging these mistakes, taking action to correct them, and moving on. If you fail, admit it openly to your team members, and explain how you have learned from this experience. This will garner more respect for you and in your ability to continue leading despite failure. Set goals and strive for them. Of course, you don’t want to change too many things at once, particularly when you have a franchise like ours with particular methods that have stood the test of time. However, there is nothing wrong with looking into areas where you could expand and setting goals to help you succeed. Look critically at your business for areas that could be improved, pinpoint one, and focus on it till it improves. Then you can do the same with other areas of the business. While too much change can bring in new problems to address, setting goals for growth incrementally can help you succeed as a business and develop new leadership skills. The primary advantage of investing in a franchise opportunity rather than starting your own small business is the incredible access to resources. At ProSource, we pride ourselves on always giving our franchisees everything they need to thrive, including mentorship. If you need advice about leading a team or any other aspect on your business, we make ourselves available to our franchise owners in any way that we can. Use us as a resource to develop your leadership skills to ensure the success of your franchise. If you are ready to get started with your own home improvement franchise, we offer one of the best franchise opportunities out there. Contact ProSource today to get started.